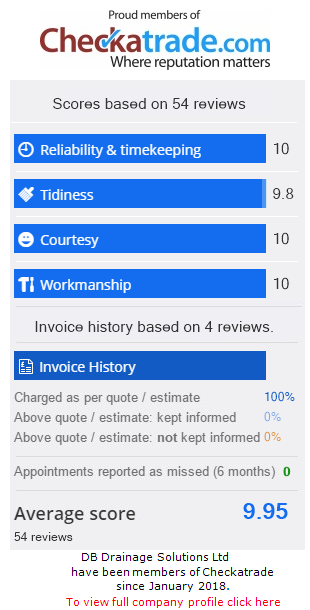 At DB Drainage Solutions Ltd we understand that people have jobs and places to be , that’s why we work around your needs and requirements , we work efficiently keeping costs down to return your drainage to a serviceable state . Our extensive industrial knowledge and state of the art equipment allows work to be carried out quickly and efficiently giving clients cost effective and professional service. We offer highest levels of consideration to safety and environmental issues on all of our projects and you can be confident of a quality of service every time. We offer no dig solutions : drains lining repairs , drain patching repairs , soil vent pipe replacement , full ‘re route drainage , installation of drainage on a large scale , we can update your drawing , excavation repairs both internal and external , and much more. All our repairs have a 5 YEAR guarantee.